Purpose: To evaluate whether 4.0 x 4.0 mm dental implants could be an alternative to implants at least 8.5 mm long, which were placed in posterior jaws in the presence of adequate bone volumes. Materials and methods: One hundred and fifty patients with posterior (premolar and molar areas) mandibles having at least 12.5 mm bone height above the mandibular canal or 11.5 mm bone height below the maxillary sinus, were randomised according to a parallel group design, in order to receive one to three 4.0 mm-long implants or one to three implants which were at least 8.5 mm long, at three centres. All implants had a diameter of 4.0 mm. Implants were loaded after 4 months with definitive screw-retained prostheses. Patients were followed up to 4-month post-loading and outcome measures were prosthesis and implant failures, any complications and peri-implant marginal bone level changes. Results: No patients dropped-out before the 4-month evaluation. Three patients experienced the early failures of one 4.0 mm-long implant each, in comparison to two patients who lost one long implant each (difference in proportion = 0.01; 95% CI -0.06 to 0.09; P = 0.50). Consequently, two prostheses in each group could not be delivered as planned (difference in proportion = 0; 95% CI -0.07 to 0.07; P = 0.69), and one patient from each group is still waiting to have their prostheses delivered. Three short implant patients experienced three complications versus two long implant patients (difference in proportion = 0.01; 95% CI -0.06 to 0.09; P = 0.50). There were no statistically significant differences in prosthesis failures, implant failures and complications. Patients with short implants lost on average 0.38 mm of peri-implant bone at 4 months and patients with long mandibular implants lost 0.42 mm. There were no statistically significant differences in bone level changes up to 4 months between short and long implants (mean difference = 0.04 mm; 95% CI: -0.041 to 0.117; P = 0.274). Conclusions: Four months after loading, 4.0 x 4.0 mm implants achieved similar results as 8.5 x 4.0 mm-long or longer implants in posterior jaws, however 5 to 10 years post-loading data are necessary before reliable recommendations can be made. Purpose: To evaluate the effectiveness of a bone substitute covered with a resorbable membrane versus open flap debridement for the treatment of periodontal infrabony defects. 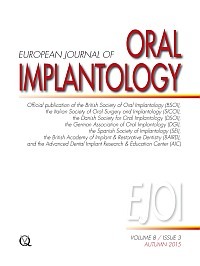 Materials and methods: Ninety-seven patients with one infrabony defect, which was 3 mm or deeper and at least 2 mm wide were randomly allocated either to grafting with a bone substitute covered with a resorbable barrier (BG group) or open flap debridement (OFD group) according to a parallel group design in five European centres. Blinded outcome measures assessed tooth loss, complications, patient's satisfaction with treatment and aesthetics, changes in probing attachment levels (PAL), probing pocket depths (PPD), gingival recessions (REC), radiographic bone levels (RAD) on standardised periapical radiographs, plaque index (PI) and marginal bleeding index (MBI). Results: 49 patients were randomly allocated to the BG group and 48 to the OFD group. At baseline there were more mobile teeth in the BG group (29 versus 15). One year after treatment two patients dropped out from the BG group and no teeth were lost. Three complications (minor postoperative wound dehiscence) occurred in the BG group versus none in the OFD group, where the difference was not statistically significant. The BG group obtained significantly greater statistical PAL gain (mean difference = -0.8 mm, 95%CI [-1.51; -0.03], P = 0.0428), PPD reduction (mean difference = -1.1 mm, 95%CI [-1.84; -0.19], P = 0.0165) and RAD gain (mean difference = -1.2 mm, 95%CI [-2.0; -0.4], P = 0.0058) compared to the OFD group. No statistically significant differences between the groups were observed for gingival recession, or the patient's satisfaction with the treatment and aesthetics. There were some statistically significant differences between the centres for PAL and PPD with the Italian centres reporting better outcomes. Conclusions: The use of a bone substitute covered with a resorbable membrane yielded significantly better statistical clinical outcomes than open flap debridement in the treatment of periodontal infrabony defects deeper than 3 mm, with regard to PAL gain, PPD reduction and RAD gain. Purpose: To evaluate clinical safety and effectiveness of a novel calcium-incorporated titanium implant surface (Xpeed, MegaGen Implant Co., Gyeongbuk, South Korea). Materials and methods: Sixty patients were randomised to receive one to six implants in the maxilla with either calcium-incorporated (Xpeed) or control resorbable blasted media (RBM) surfaces, according to a parallel group design at two centres. Implants were submerged and exposed at three different endpoints in equal groups of 20 patients, each at 12, 10 and 8 weeks, respectively. Within 2 weeks, implants were functionally loaded with provisional or definitive prostheses. Outcome measures were prosthesis failures, implant failures, any complications and peri-implant marginal bone level changes. Results: Thirty patients received 45 calcium-incorporated implants and 30 patients received 42 control titanium implants. Three years after loading four patients dropped-out from the Xpeed group and one from the RBM group. No prosthesis or implant failures occurred. There were no statistically significant differences between the groups for complications (P = 0.91; difference in proportions = 0.79 %; 95% CI -0.71 to 2.29) and mean marginal bone level changes (P = 0.88; mean difference = -0.02 mm; 95% CI -0.26 to 0.22). Conclusions: Both implant surfaces provided good clinical results and no significant difference was found when comparing titanium implants with a nanostructured calcium-incorporated surface versus implants with RBM surfaces. Purpose: To evaluate whether short (5.0 to 8.5 mm) dental implants could be a suitable alternative to longer (at least 11.5 mm-long) implants placed in atrophic maxillae augmented with autogenous bone for supporting dental prostheses. Materials and methods: Twenty-eight patients with fully edentulous atrophic maxillae, whom had 5 to 9 mm of residual crestal bone height which was at least 5 mm thick, measured using computerised tomography (CT) scans, were randomised into two groups either to receive 4 to 8 short (5.0 to 8.5 mm) implants (15 patients) or autogenous bone from the iliac crest to allow the placement of at least 11.5 mm-long implants (13 patients). Bone blocks and the windows at the maxillary sinuses were covered with rigid resorbable barriers. Grafts were left to heal for 4 months before placing implants which were submerged. After 4 months, provisional reinforced acrylic prostheses or bar retained overdentures were delivered. Provisional prostheses were replaced, after 4 months, by definitive screw-retained metal-resin cross-arch restorations. Outcome measures were prosthesis and implant failures, any complications, peri-implant marginal bone level changes and patient satisfaction. Patients were followed up to 1 year after loading. Results: All patients were rehabilitated with implant-supported prostheses but two patients dropped out from the augmented group. One bilateral sinus lift procedure failed for infection, although short implants could be placed. One implant failed in the augmented group versus two short implants in two patients (Fishers exact test P = 1.00; difference in proportions = 0.06; 95% CI -0.28 to 0.17). All failures occurred before loading. Significantly more complications occurred in augmented patients: eight complications occurred in 5 augmented patients (all of them complained of pain 1 month after bone harvesting from the iliac crest) versus no complications in the short implant (Fisher's exact test P = 0.013; difference in proportions = 0.38; 95% CI 0.11 to 0.65). Both groups presented a significant peri-implant marginal bone loss at 1 year after loading (P < 0.0001); -1.05 (0.20) mm for short implants and -1.01 (0.16) mm for the augmented group, respectively, with no statistically significant differences between the two groups (mean difference -0.04 mm; 95% CI -0.22 to 0.14; P = 0.59). All patients were fully satisfied with the treatment and would have it again. Conclusions: This pilot study suggests that short implants may be a suitable, cheaper and faster alternative to longer implants placed in bone augmented with autogenous bone for rehabilitating edentulous atrophic maxillae, however, these preliminary results need to be confirmed by larger trials with follow-ups of at least 5 years. Purpose: The objective of this parallel randomised controlled trial is to compare two bone substitutes and collagen membranes in a one-stage procedure for horizontal bone augmentation: anorganic bovine bone (Bio-Oss) and collagen porcine membranes (Bio-Gide) (BB group) versus a synthetic resorbable bone graft substitute made of pure β-tricalcium phosphate (Ceros TCP) and porcine pericardium collagen membranes (Jason) (CJ group). Materials and methods: Patients in need of implant treatment having at least one site with horizontal osseous defects at a private clinic in Rimini (Italy) were included in this study. Patients were randomised to receive either the BB or CJ treatment. Randomisation was computer-generated with allocation concealment by opaque sequentially numbered sealed envelopes. Patients and the outcome assessor were blinded to group assignment. The main outcome measures were implant failure, complications, clinical bone gain at augmented sites, and complete filling of the bone defect. Secondary outcome measures were chair-time, postoperative pain and peri-implant marginal bone level changes. Results: Twenty-five patients with 32 implants were allocated to the BB group and 25 patients with 29 implants to the CJ group. All 50 randomised patients received the treatment as allocated and there were no dropouts up to 6-months post-loading (12 months post-surgery). There were no failures and there were three complications in the BB group and three complications in the CJ group (relative risk: 1.00, 95% CI from 0.22 to 4.49, P = 1.00). The estimated difference between treatments in the vertical defect bone gain was -0.15 mm (95% CI from -0.65 to 0.35, P = 0.5504) favouring the BB group, and the estimated difference between treatments in the horizontal defect bone gain was -0.27 mm (95%CI from -0.73 to 0.19, P = 0.3851) favouring the BB group. There was no difference in the complete filling of the defect (relative risk: 0.88, 95%CI from 0.58 to 1.34, P = 0.7688). No significant differences were detected for chair-time (P = 0.3524), for VAS pain immediately after surgery (P = 0.5644), VAS pain after 1 week (P = 0.5074) and VAS pain after 2 weeks (P = 0.6950). A slight difference (0.24 mm, 95%CI from 0.0004 to 0.47, P = 0.0464) was detected in radiographic peri-implant bone loss favouring the CJ group. Conclusions: No significant differences, except for radiographic bone loss, were observed in this randomised controlled trial comparing anorganic bovine bone with collagen porcine membranes versus synthetic resorbable bone made of pure β-tricalcium phosphate with pericardium collagen membranes for horizontal augmentation. Purpose: To compare the clinical outcome of implants inserted in sites prepared with a simplified protocol consisting of one single drill versus multiple conventional drilling steps. Materials and methods: In two private clinics, 40 patients, requiring one single implant and having a residual bone height of at least 10 mm and a thickness of at least 5 mm measured on computerised tomography (CT) scans, were randomised after flap elevation to have the implant site prepared using a single drilling step with a newly designed tapered-cylinder drill (1-drill group) or a conventional procedure with multiple drills (multiple-drill group). Implants were left to heal non-submerged for 3 months and then they were loaded with a final metal-ceramic crown. Outcome measures were: implant failure; any complications; peri-implant marginal bone level changes assessed by a blinded outcome assessor; operation time; operator preference and post-surgical pain, swelling and analgesic consumption. All patients were followed up to 4 months after implant loading. Conclusions: Within the limits of this trial, both drilling techniques produced successful results over a 4-month post-loading follow-up period, but the single bur procedure required less surgical time and lead to less postoperative morbidity. Purpose: The aim of this article is to present a referred clinical case of an inferior alveolar nerve laceration during the insertion of a dental implant in the mandible, that came to our attention after the injury. Materials and methods: A 71-year-old female was treated by a colleague in order to be rehabilitated with a fixed implant-supported prosthesis for her missing teeth in positions 44, 45 and 46. After implant site osteotomy in region 46, the speed of the surgical motor was not changed; as a consequence, the implant was inserted at 1200 rpm and intruded into the mandibular canal, causing the laceration of the neurovascular bundle. Results: During the first 2 weeks after surgery the patient complained of paresthesia in the mental and lower lip area, with labial ptosis and drooling. After 14 days, the paresthesia reduced and mucosal and gingival normosensitivity was detected; however, the patient complained about hyperesthesia of the lower inside lip. After 21 days, the lower lip tone and function were almost completely restored and the paresthesia was further reduced, however the hyperesthesia persisted. Conclusions: It is extremely important to pay attention to preventing neurological complications through proper preoperative planning, careful execution of the surgical techniques and correct management of instruments and motor speed settings. The latter procedure should be double-checked by both the operator and the assistant.